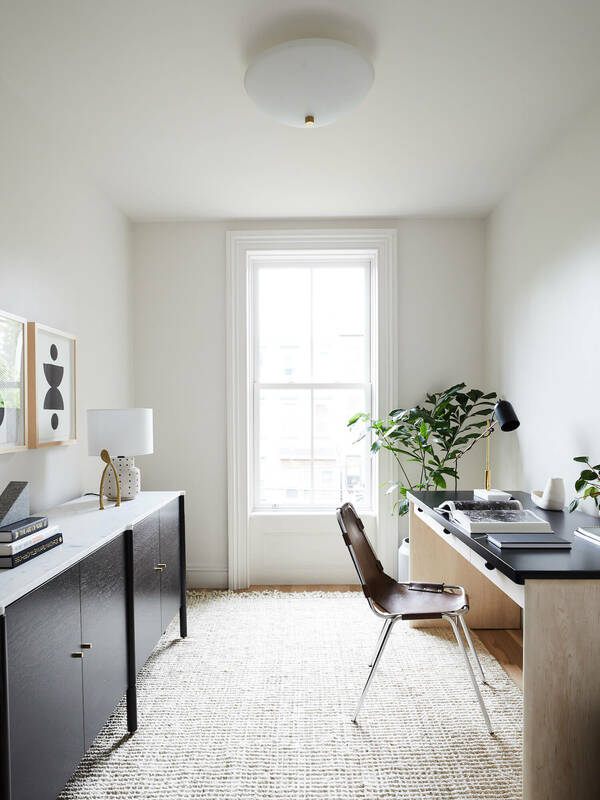 A Brooklyn brownstone embarks on a new heyday thanks to an impeccable facelift by our NYC friends at nune and Frances Mildred Architectural Design. 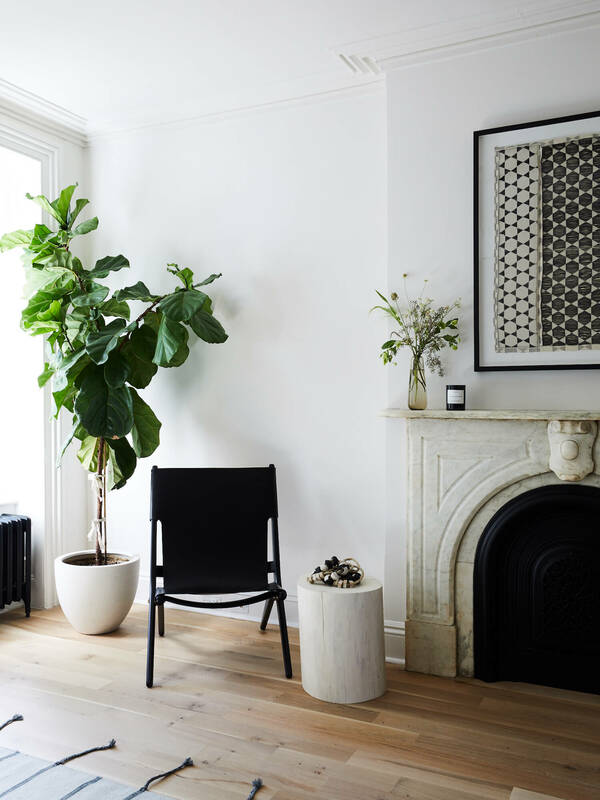 We first clapped eyes on the Slope Townhouse, a 19th century Victorian brownstone in Brooklyn, when we interviewed nune founder Sheena Murphy. Particularly struck by the ‘Pigeon-coloured’ kitchen joinery and natural light that shines on all of the home’s design objects, we couldn’t wait to peek inside a few more of the home’s regal spaces. 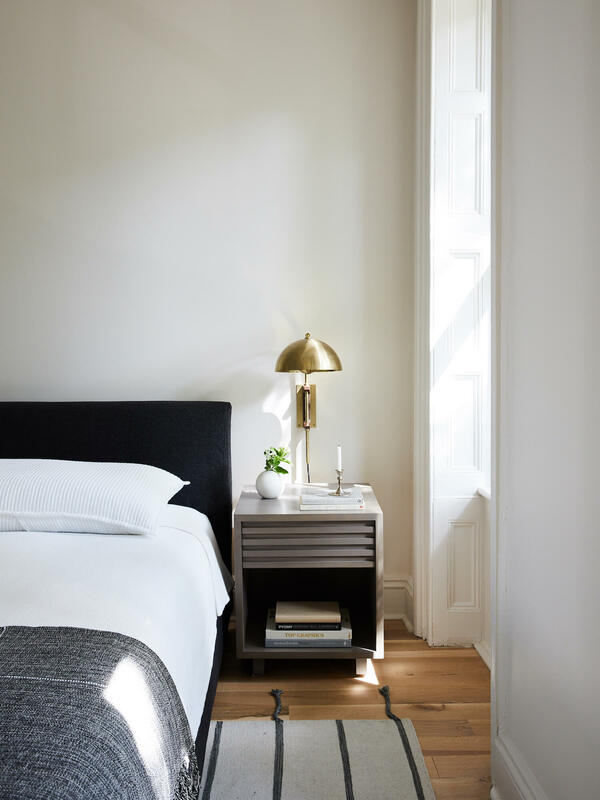 We weren’t disappointed either, as Nune partnered with fellow NYC studio Frances Mildred Architectural Design to go to great lengths salvaging the old and paying homage to its history and happening neighbourhood. 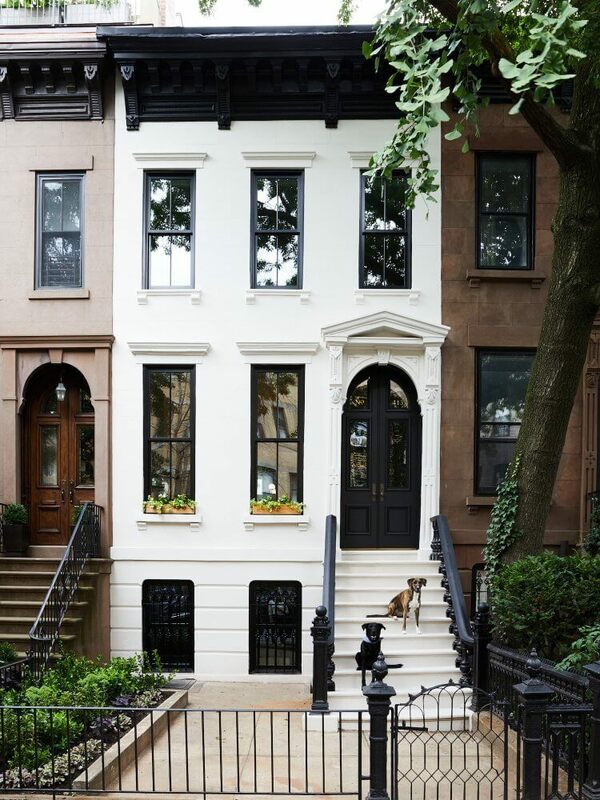 While fortunately part of the Brooklyn neighbourhood of Park Slope, this Brownstone dating back to the 1890s didn’t reflect its prized location. 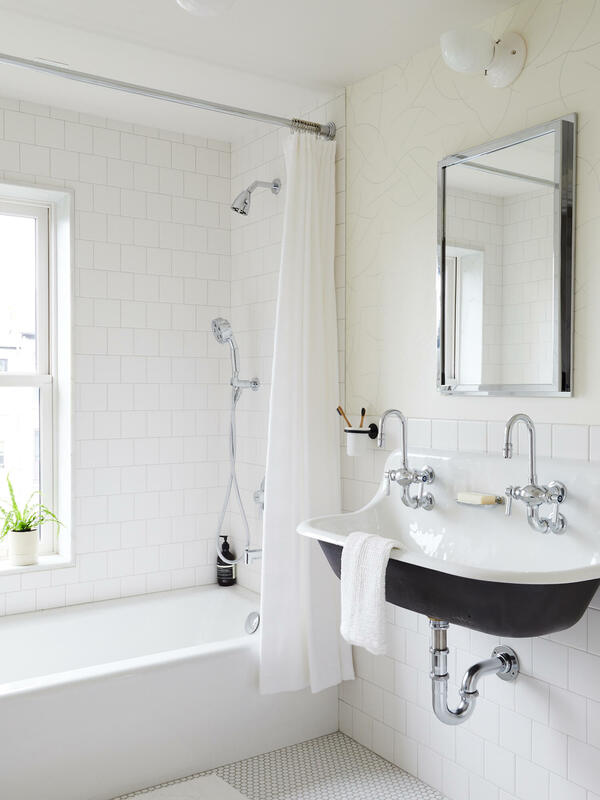 When owners Lindsey Branca and Mike Grosshandler of Branca & Co. bought it as an investment property, it was in a state of utter disrepair and needed to be completely gutted. 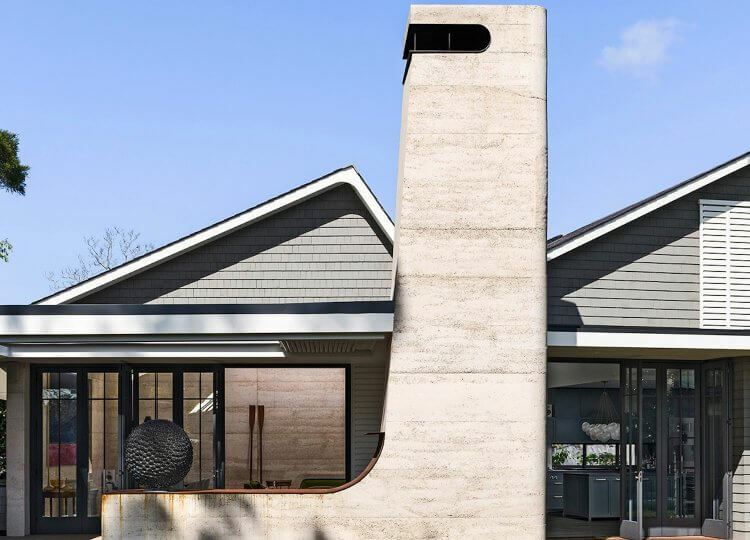 But they knew exactly the person for the job – Sheena Murphy, founder of nune – who had worked on a previous project for the couple. 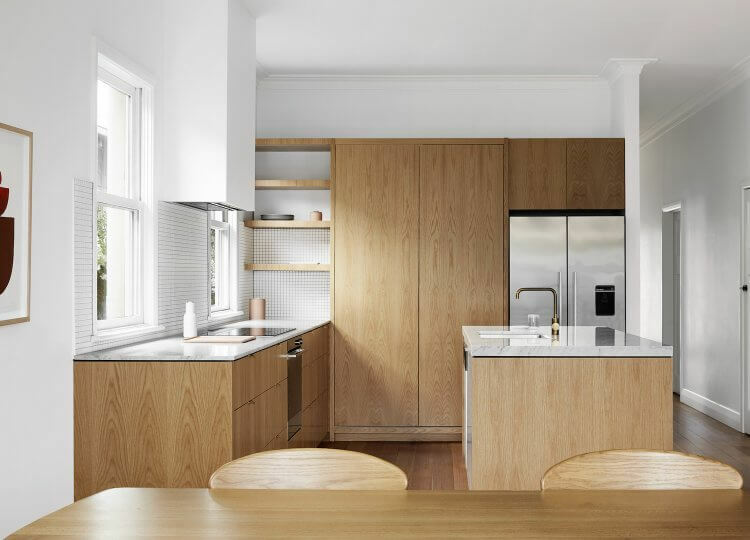 The owners then called upon Frances Mildred Architectural Design to lead the architectural requirements of the home. 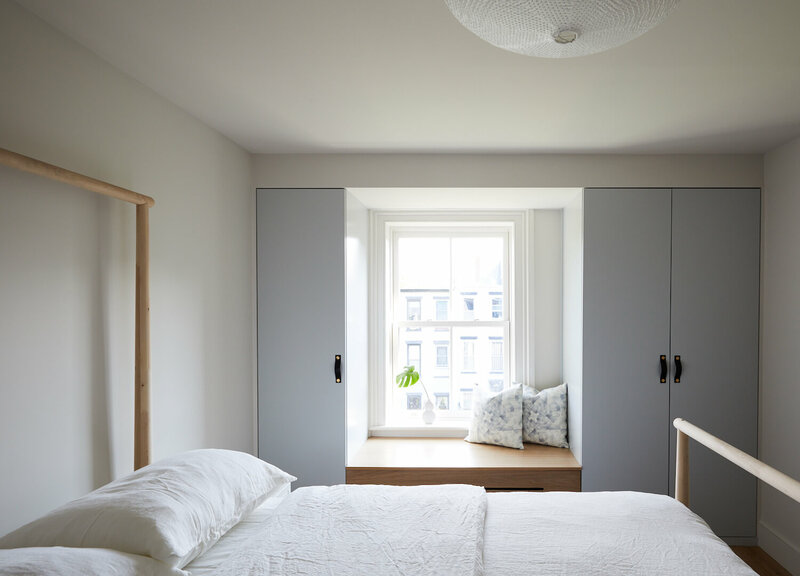 The Victorian townhouse may have been far from its original state, but this was no deterrent to restore it as close as possible to its original layout and period features. 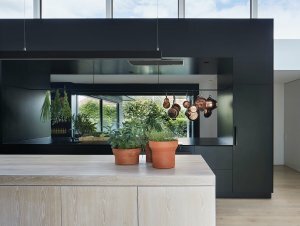 This was also central to creating the high-end home for a New York family and the choices of high quality finishes throughout. 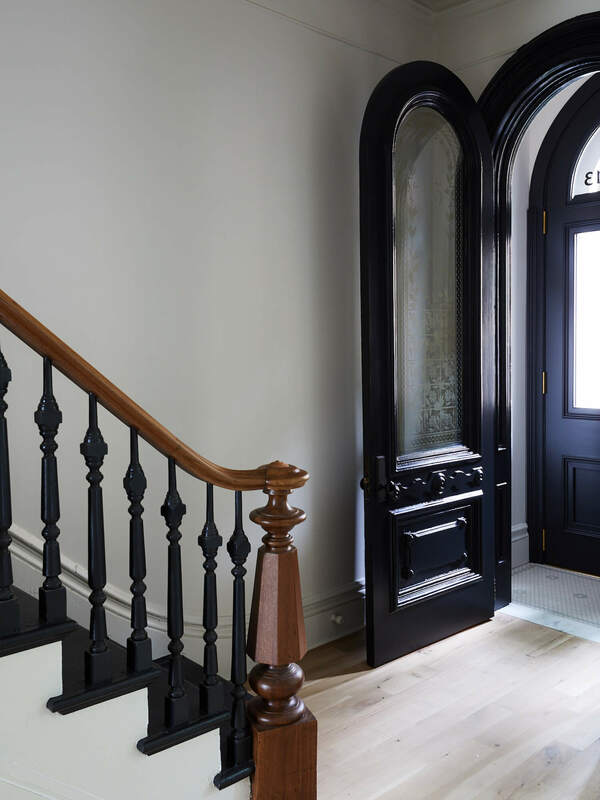 Take the staircase for example, which was reinforced and maintains all of the original treads, balusters and handrail, painted in a classic black and white. 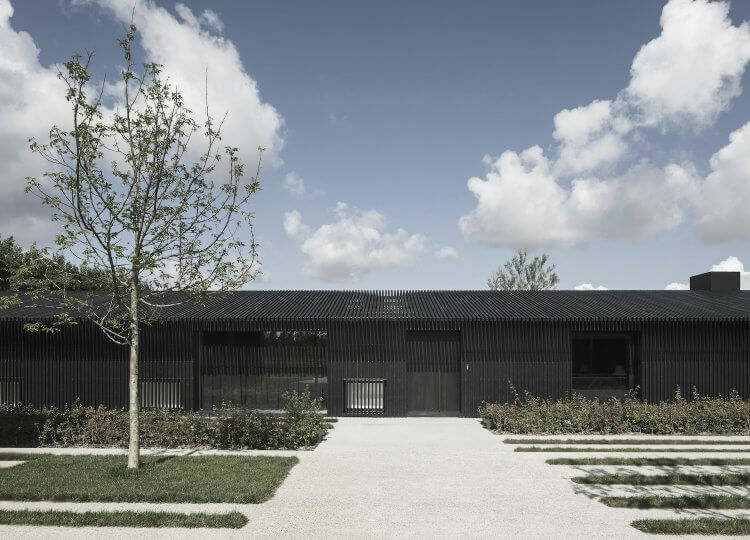 The exterior of the house also takes on this classic contrast, with Benjamin Moore’s Black trimmings and Farrow & Ball’s Skimming Stone (off-white) facade. 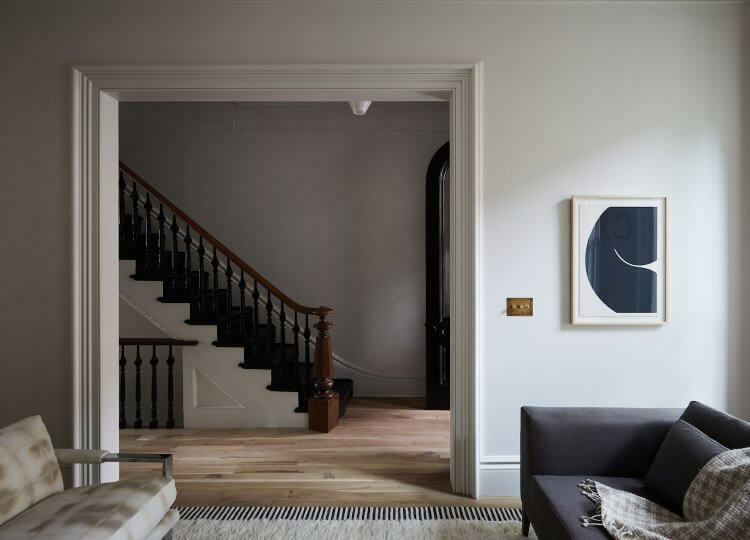 Inside, nune and Frances Mildred Architectural Design maintained most of the old doors, while reusing materials taken from parts of the house and placing them in other areas of the home. 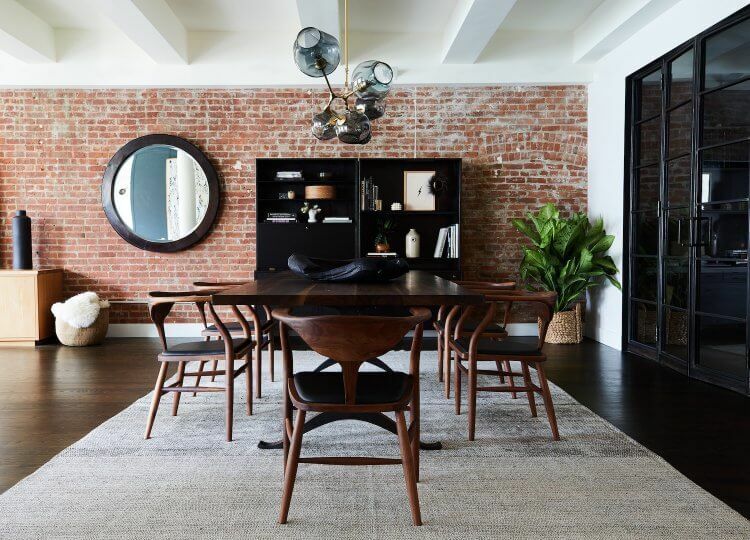 The furnishings of the home are a friendly mix of vintage and local that really capture the home’s new sense of sophistication. 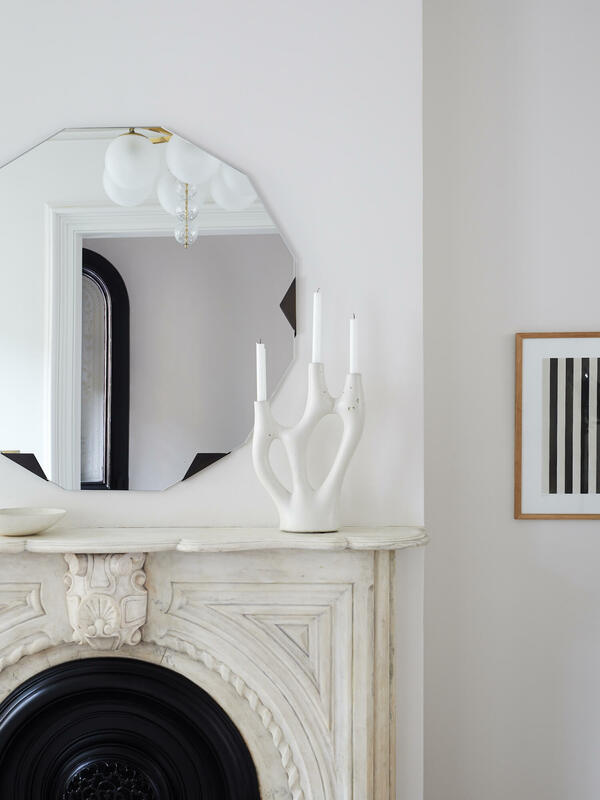 In particular, nune point out their focus on NYC brands such as Brooklyn-based studio Vonnegut Kraft, who’ve designed the cast concrete Dune Candelabra on the dining table and the desk in the study. 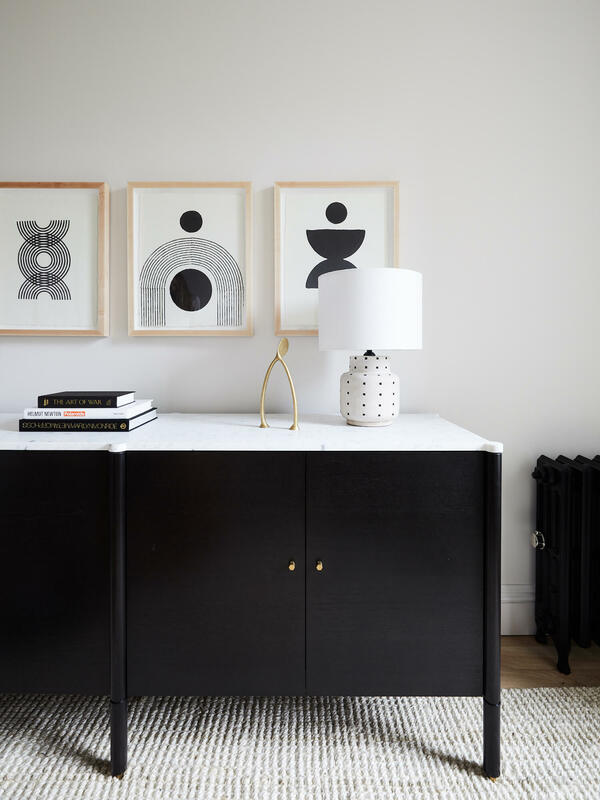 Also on show in the study is the Credenza side table by local design stars Egg Collective and their Haynes Mirror in the living room, while Studio Four NYC are the big apple name behind the custom rug in the bedroom. 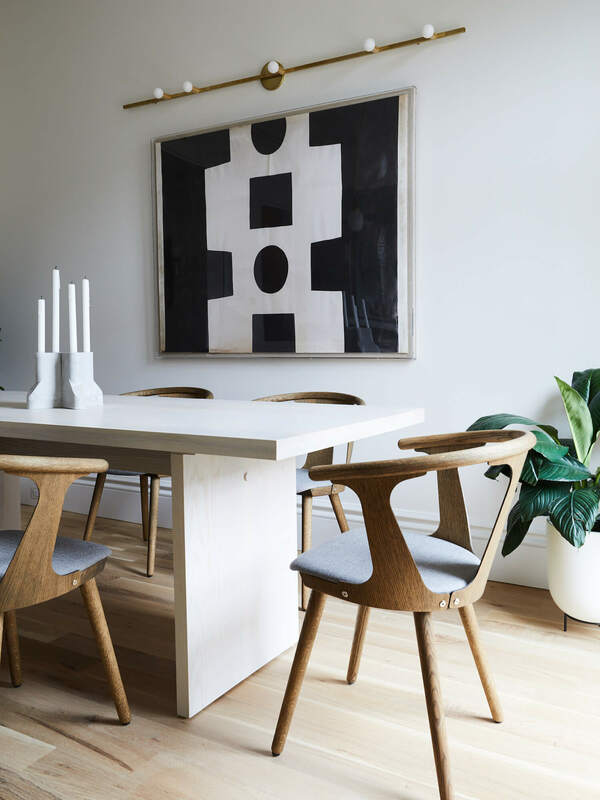 New York city native Rebecca Atwood is responsible for the Taupe Shibori Fabric on the reupholstered vintage chrome-framed chairs. 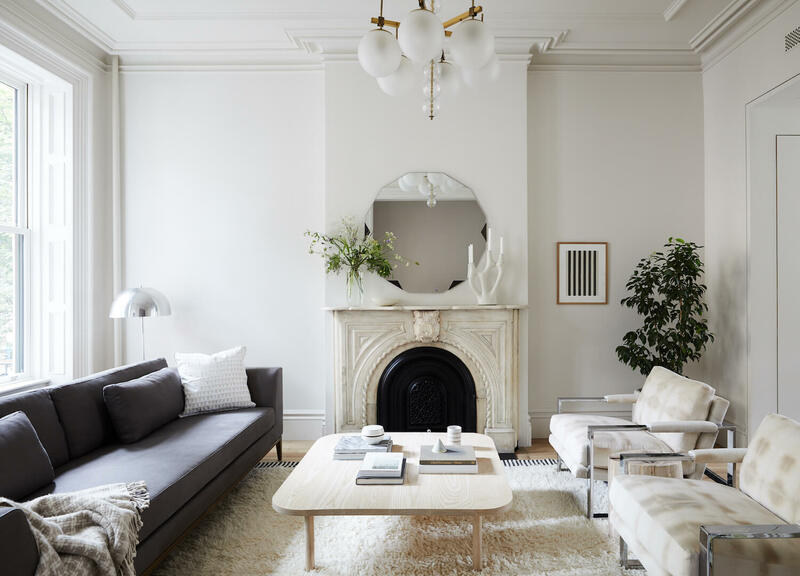 The special vintage objects in the home include the chandelier from Morentz and the floor lamp from Greenpoint, Brooklyn in the living room. 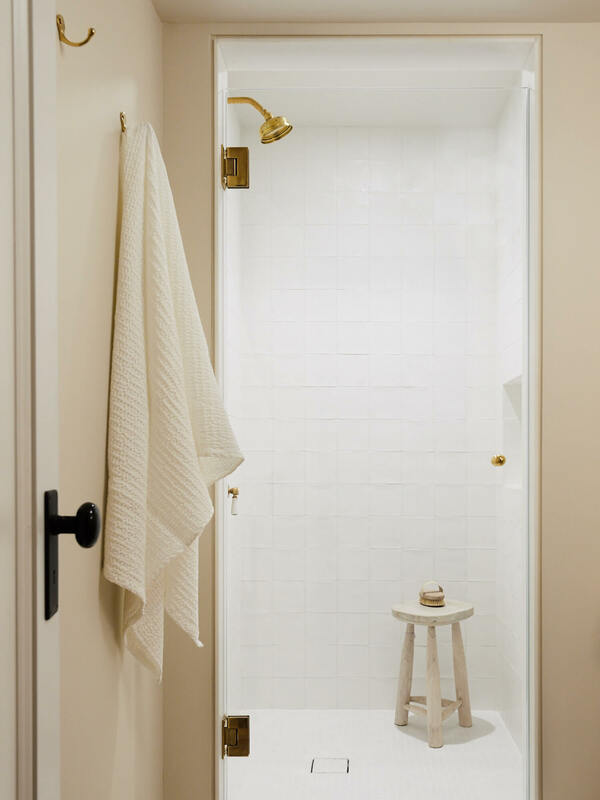 We all know every project has its budget and nune’s integration of elements from a more affordable tier are second-to-none. 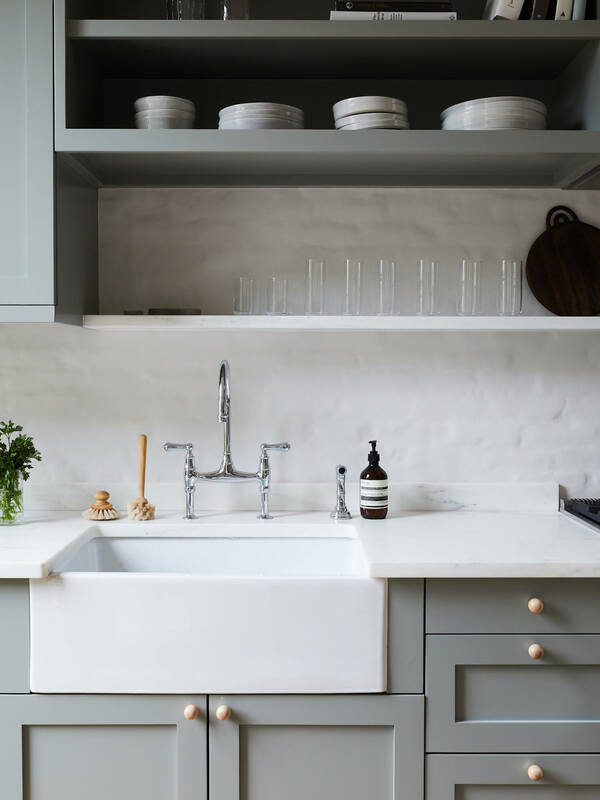 You wouldn’t have guessed the kitchen cabinets are from Ikea – but that’s because they’ve got Semihandmade cabinet fronts, beautifully painted in Farrow & Ball’s Pigeon. 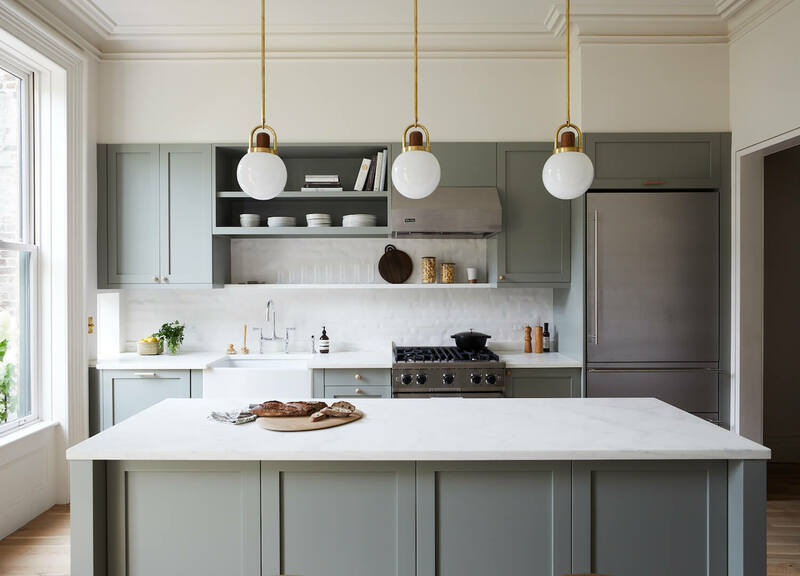 The ABC Stone marble bench top elevates the old time elegance of the kitchen space – as does the Arc Globe Pendants from Allied Maker. Tying in with this esteemed theme is a Crate & Barrel dining table with &Tradition In Between Chairs tucked underneath. 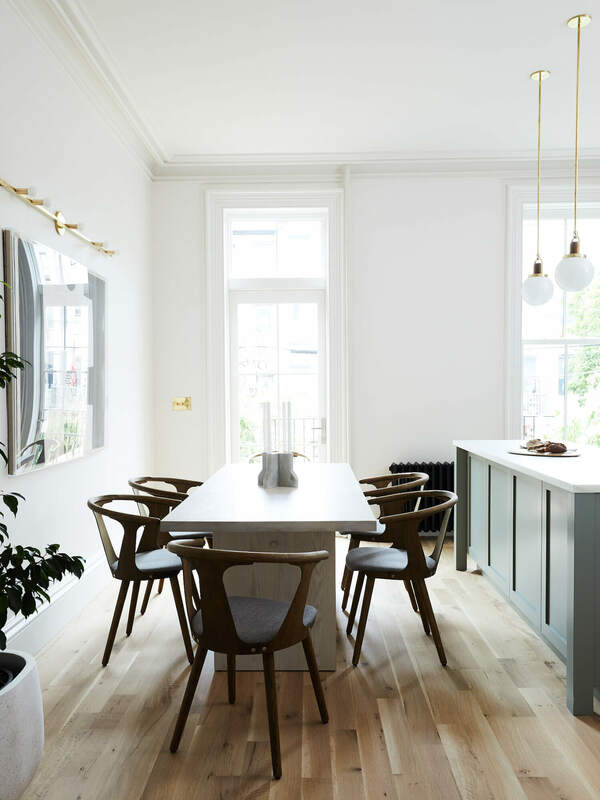 The slope townhouse mingles with a classic sensibility and a warm, contemporary personality. 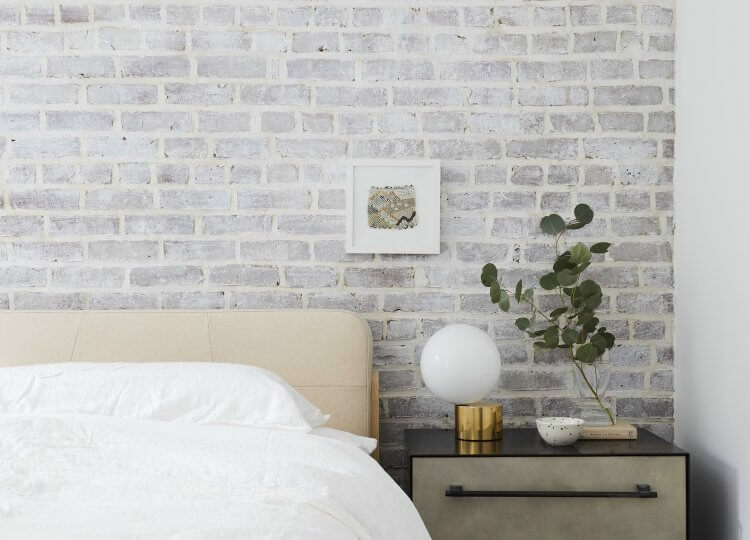 Showcasing some of the best design coming out of this city that never sleeps, we’d be lounging in their classic spaces in a New York minute. Coffee table by Year of None and Sofa from Restoration Hardware. 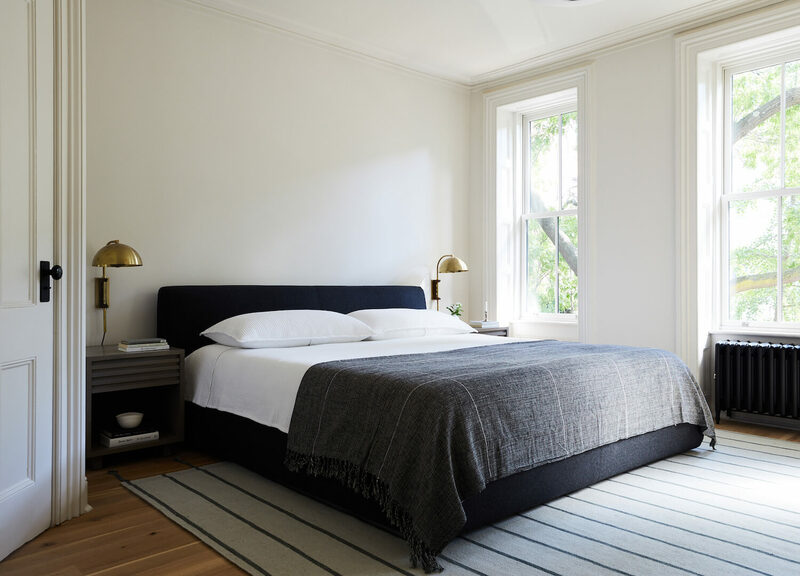 The Nest Storage Bed from DWR topped with Parachute linen and bedside Pigalle Sconces from Allied Maker. Leather folding Saxe Chair from By Lassen and the Stump Table from Sawkille.